Join Larry Becker to learn the ins and outs of the amazing Canon EOS R! Whether you just picked one up or are thinking about adding one to your kit, you’ll want to learn all the hidden features and pro tips that set this camera apart. From features such as programmable controls to flexible priority mode to shooting video, Larry teaches you how to set them up (and more!) and get the most out of them. 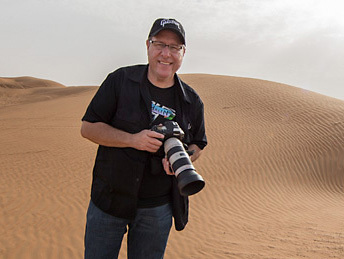 Larry wraps up the class with three interviews with professional photographers, Joel Grimes, Roberto Valenzuela, and Rick Sammon who have a lot of insights to share from their early hands on experience with the EOS R.
If you are new to DSLR photography, then this class is for you. Join Scott Kelby as he takes you through the ten most important things every photographer should know about their camera. We all want to get great images, and taking the time to get to know the ten or so most important features on our cameras can really help keep our photos sharp, clean, well exposed, and showing the right colors whether we’re shooting moving subjects or still landscapes. This class may be named the top ten, but Scott manages to pack a whole lot more into each lesson, providing a firm foundation for getting the most out of every tip and technique. Still trying to get one of theses bad boys from Canon UK!